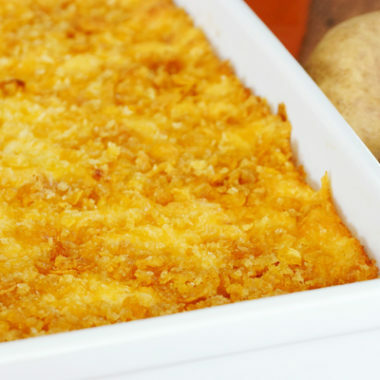 Your whole family will love this Cheesy Potatoes Recipe, it's great with breakfast, lunch or dinner! In a large pot, melt stick of butter, add celery salt, onion salt, and flour and stir continuously until smooth, bubbly, and golden brown-that's a roux. While stirring, add chicken stock to your roux, mix well and add milk. Bring almost to a boil. Remove from heat, add 2 cups cheddar, mix well. In the same pot, thoroughly combine potatoes, rest of the cheese, garlic powder, and sour cream to the roux. Spread evenly in 9x13 pan. In a small bowl combine crushed corn flakes and panko. Sprinkle evenly over the top of the potatoes. Bake, uncovered, at 350˚ for 45 minutes or until crispy and golden brown on top. Freezer Instructions: Prepare in a disposable aluminum pan, cover with aluminum foil and freeze before baking. To heat: Bake at 400˚ for 1 hour or until crispy and golden brown on top. Let rest for 10 minutes before serving.